How do we get Ivy League students interested in changing the world? 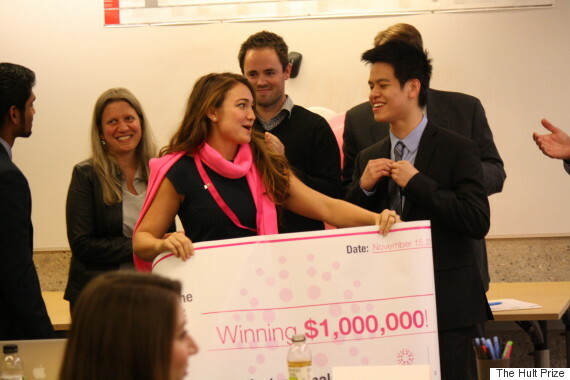 Fluorescent pink posters with one simple message: "Do you want to win $1,000,000?" 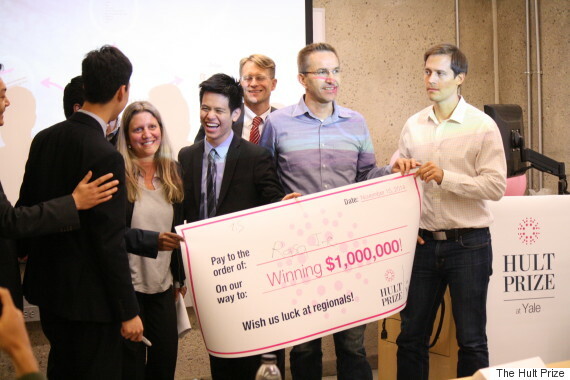 Now, the Hult Prize is far from just a contest to win a million dollars. The Hult Prize is the world's largest student competition for social enterprise. Partnered with President Bill Clinton and the Clinton Global Initiative, and funded by Bertil Hult, the award is given to one winning team that has spent a year fine-tuning an innovative idea to solve an important global issue. And yet this pink poster is evidence that, in order to get Ivy Leaguers attention, it seems that success always needs to be quantified. Don't get me wrong; Ivy Leaguers are incredible risk-takers -- on paper. They have an insatiable thirst for knowledge about unique subjects and are constantly exploring different intellectual themes. They learn impractical foreign languages; spend their summers volunteering in far-away places, and research the most niche topics. Yet, when it comes to execution, the majority of the student body is still entirely risk-averse. When junior year rolls around the corner, we all turn our heads back to that safe summer internship that propels us into future success. Although "social enterprise" is now at least a known term, students still don't view it as a safe and viable career option. My peers still don't quite understand, or believe, that it's possible to work for an organization that achieves both social impact and financial success. Social good and profit are considered dichotomies. It's either about making a sacrifice to join the Peace Corps, or taking the first step towards economic success by joining a two-year program at a prestigious company, en route to a six-figure salary -- with the hopes of helping society once financially stable. But like Ricardo Semler, CEO of Semco Partners and author of Turning Your Own Table, says in his TED Talk, "When you think and you say, now is the time to give back -- well, if you're giving back, you took too much." Having worked at the heart of Yale's growing social enterprise movement, I've been fascinated by the increasing energy from students, and disappointed by the lack of institutional infrastructure to harness the enthusiasm. You would think that Yale might be a feeding ground for social innovation. We have America's largest student-run service organization and when 1,042 students were surveyed asking if they would take an introductory course entitled: "Social Entrepreneurship and Social Innovation," 69 percent responded affirmatively. Additionally, we are lucky enough to call Bill Drayton and Linda Rottenberg, iconic figures in the social enterprise movement, part of our alumni network. In a recent speech to alumni, President Peter Salovey even called entrepreneurship with an impact, the "Yale way," given the university's legacy of social impact work. It seems that we meet all of the criteria necessary to make Yale the Mecca for social enterprise: student interest, an inspiring alumni network, presidential support. And yet, our social innovation infrastructure still lags behind many of our peer institutions.' The only undergraduate course dedicated to social enterprise was a junior seminar capped at 18 students and was canceled this spring. Besides a student-run chapter of Net Impact, there is no central hub for potential social entrepreneurs to congregate. This blatant lack of institutional support fosters a culture where students see social enterprise as an extracurricular activity, detached from the real world. The concept of doing social good and being economically successful are still mutually exclusive conditions because no structures exist to prove that a prosperous career path can include both. So it seems that "social enterprise" is a term more frequently talked about than embodied. Being the Campus Director for the Hult Prize at Yale made me realize how far behind Yale stands in rallying its students to make a global impact through entrepreneurship. The Hult Prize at Yale had eleven registered teams, and I was incredibly excited to see 44 students across the undergraduate and professional schools coming up with a real business solution to solve a global issue. And yet, universities in Bangladesh, Pakistan, Indonesia, and Brazil had between 100 and 400 teams registered to compete. That's over 1,000 students from one university with profitable ideas on how to fix "Early Childhood Education in the Urban Slum," this year's presidential challenge. As I near graduation, I've noticed my peers and I suddenly have a checklist of criteria our first job has to fit. It must be financially successful, intellectually stimulating, something we are "passionate" about, and a benefit to society. Being able to meet all four of these measures is adding more stress to an already demanding job search. And yet, this is our privilege: to have passion and to be able to take a risk. A lot of Ivy League students are lucky enough to graduate relatively debt-free. At the very least, we graduate in our early twenties with years of professional growth ahead. So why should we seek the highest paying job that will land us back in New York with other Ivy League graduates, when we have the privilege to take a chance and make a difference? The Hult Prize grants students the opportunity to tackle a massive global challenge, with the financing to do so successfully. So when it comes to risk-taking and making an impact, we need to refocus our attention from the $1,000,000 salary to the million-dollar idea.